We are located on the corner of Northern Ave and W. Ponce de Leon Ave in downtown Decatur. 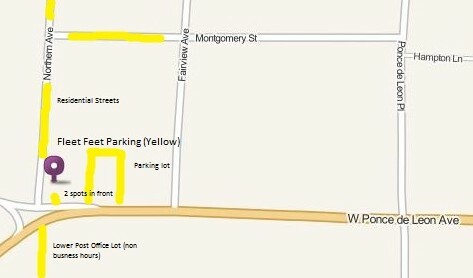 Parking is available (yellow below) in the lot next to the building, on the residential side streets, or at the lower Post Office lot across the street (non business hours). Our address is 431 W Ponce de Leon Ave, Decatur and our phone number is 404-371-0208.